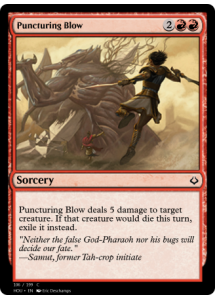 Puncturing Blow deals 5 damage to target creature. If that creature would die this turn, exile it instead. "Neither the false God-Pharaoh nor his bugs will decide our fate."